During the first class meeting of my cohort for a Masters in Educational Administration, I was introduced to a very unique idea for the focus of secondary education. At least for me this may have been a unique idea. The concept put forth to the class was simply that the focus of education at the secondary level needs to be centered upon three basic ideas: teaching students to think critically, work collaboratively and communicate effectively. The premise is that through all subjects these “Three C’s” must be at the core of the education as it is these three concepts that will prepare students for their future. The idea was, that in order for our current students to succeed in their future they needed to be adept in these three basic skill sets. In a world where the only thing certain is that things change and where the future of the job market can no longer be mapped for fifty years as was once the case before the technological revolution. It is almost impossible now to predict what the job market will look like five years from now let alone ten or twenty years down the line. It is imperative that students become problem solvers through the use of critical thinking skills. In turn students must be capable of communicating effectively in that process and through the results of these problem solving efforts. And, because there are very few jobs where there is only one employee, the ability to collaborate is an absolute must in the world today and in the future. For me this was educational enlightenment even with twenty years of teaching on my resume. This actually made sense to me. I immediately started to plan and refocus my classroom to incorporate these three core ideas. I read everything I could on critical thinking and how to incorporate more in depth problem solving into my science classes. I looked for methods to improve the means of communication in the classroom focusing on the importance of all types of communication verbal, visual, written as well as through technology. I have always encouraged student collaboration in my classroom, and this served to further my resolve to get students to become more active in their roles in the classroom. I was adamant that students work together in a variety of ways throughout each class period. The last four years I have emphasized these three skill sets in each of my courses. I have created more project based learning into all of my courses. Requiring students to analyze research and present their findings. I increased the amount and level of writing in the science curriculum through TEDitorials using TED videos to encourage students to defend or deny points made by the TED speakers. I posted the Three C’s in my classroom and held periodic reviews to make sure students and I clearly understood how these ideas were being incorporated throughout the curriculum. I encouraged student input in how to develop the “Three C’s” further in my classroom. I was truly energized by this new focus. Then I presented a professional development workshop on “Dynamic Teaching in the Block Schedule” at a charter high school in Los Angeles. As part of that presentation I included the concept of the “Three C’s”. The response was quite positive from all of the teachers in attendance. The discussion was energetic and the ideas for their classrooms were flowing. And then the first suggestion came to amend the “Three C’s”. “What about adding Make Connections?” the first suggestion came. Obviously, there are going to be individuals who will feel the need more than three. But, I was happy with my three and graciously agreed that each teacher could adapt the idea as they would need to for their classroom. Then I saw two TED Talks by Sir Kenneth Robinson, “Bring on the Learning Revolution” and “Schools Kill Creativity.” I followed that up with his book “The Element: How Finding Your Passion Changes Everything.” Then my daughter gave me the book “Imagine: How Creativity Works” by Jonah Lehrer. That was quickly followed up by “A Whole New Mind: Why Right-Brainers Will Rule the Future”, by Daniel H. Pink. And of course I viewed his TED, “The Puzzle of Motivation.” In between all of this I also saw Dan Meyer’s TED “Math Class Needs a Makeover,” and started to follow his work online about real life problem solving in math without using the text. Each of these resources increased my focus on the “Three C’s” but also forced me to reconsider the idea of amending the list as had been suggested at the workshop. In each of these TEDs and books the picture of the future is one of a constant state of flux. A never ending series of changes that will leave the students of today useless if they cannot adapt. The second point that is apparent in all of these sources is the idea that the job market in the United States will only continue to shrink as most jobs that require rote memory and programmed responses are being outsourced to the cheaper job markets of China and India where their unemployed workforce outnumbers the entire population of the united States. Therefore, students of today must be on the cutting edge of creativity and design. A skill set that must tap into imagination and creativity. Which leads to the third idea to come out of my reading concerning the current push in education toward a STEM based curriculum. While STEM is a good start to a transformation of our current model of education, it stops short of what our students will need for their futures. The STEM model must be transformed to a STEAM model. Science, Technology Engineering and Math are worthless in today’s world without the functionality and purpose of design that is a direct correlation to the Arts. The last concept that these materials provided was the idea of purpose. That today and in the future everything that we do, must be attached to some common good. From Whole Foods to Avon, from NBA Cares to Clayton Kershaw and his wife, success in business must have a sense of purpose. That, what we do and what we create and even the things we say must be in light of giving back in some way to those less fortunate than ourselves or to those who make our success possible. This new generation of students are initiated into a framework that demands that they have the desire to give back in order to give their work and their success a sense purpose. It is therefore that I will transform my original “Three C’s” and amend them to become The 6 C’s for the future of Education. The new list includes: Think Critically, Communicate Cleary, Work Collaboratively, Embrace Culture, Develop Creativity and Utilize Connectivity. Critical Thinking allows the individual to manage information. Information presented in a multitude of forms from a variety of media. Information that must be filtered and analyzed, authenticated and processed, and eventually must be synthesized in a form that will be useful to the individual. Communication provides the means by which the individual can present information. Information presented in a multitude of means through a variety of media. Information that must be clear and concise, effective and engaging, and eventually be presented in a way that is meaningful to the individual and the audience. Collaboration engages the individual in the world they share through association. Association, that is created to benefit an organization and as a means to conduct business. Association that includes partnership and teamwork, leadership and assistance, and alliance that serves to benefit the whole. Culture encourages the individual to appreciate where we have come from, who we are now and how we can move into the future. Culture associates the individual to all that surrounds them: art, drama, dance poetry, history, science, religion, written and unwritten language, technology and the individual themselves. Creativity provides the avenue for expression. The structure means nothing without function. Therefore, the individual must be capable of creating something with the knowledge that they have worked so hard to obtain. It is in creating that the individual gains purpose. Connectivity places the individual in touch with their world. In today’s existence that is increasingly through the technology that is rapidly changing the way they view their world. Understanding that connections are personal no matter what the means of contact and that humanity must remain in light of how the technology may change for each individual. Can this be done in a world that measures student success by their GPA, their Alphabet Test (STAR, CAHSEE, SAT ACT, LSAT, MCAT, GRE etc…) Scores, and the shopping list of college acceptance letters? Can education be transformed in such a way that these non-standardized concepts can be placed at the core of the educational process? As an educator, I will continue to make these the priority in my classroom and in my discussion on transforming education. 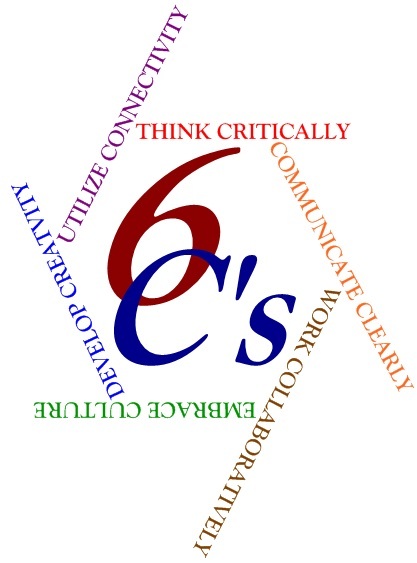 My students will leave my room each and every day, each and every week month and year, with the understanding that their future may just lie in the mastery of the “6 C’s of Education for the Future”.